We all know that crafting it trendy right now. Whether it’s turning something that would be trash into something new and usable, making wearables instead of buying them, creating items to express your personality, or just finding a fun activity for a rainy day, creative arts involving quilting, embroidering and other sorts of thread or yarn crafts have never been more popular. The great thing for those who do those activities, whether it’s for business or fun or a combination of the two, is that crafting has been shown to have a lot of benefits beyond resulting in a beautiful finished project. One big benefit of crafting is reducing stress. The repetitive motions required by some crafting projects induce a state that’s almost like meditation. Activities like knitting have been shown to help people with anxiety disorders cope with their anxiety issues. Just taking the time to focus on a project and relax can have huge benefits when it comes to lessening stress levels. Reduced stress leads to lower blood pressure, better sleep, a reduced risk of heart attacks and strokes and a greater quality of life. Creating things, whether it’s through using a craft kit or making your own design from scratch has also been shown to improve mental function and head off age-related mental decline. Studies have shown that people who do activities, crafting among them, that keep their minds active have a much better chance of avoiding problems like dementia, loss of memory or cerebral atrophy. 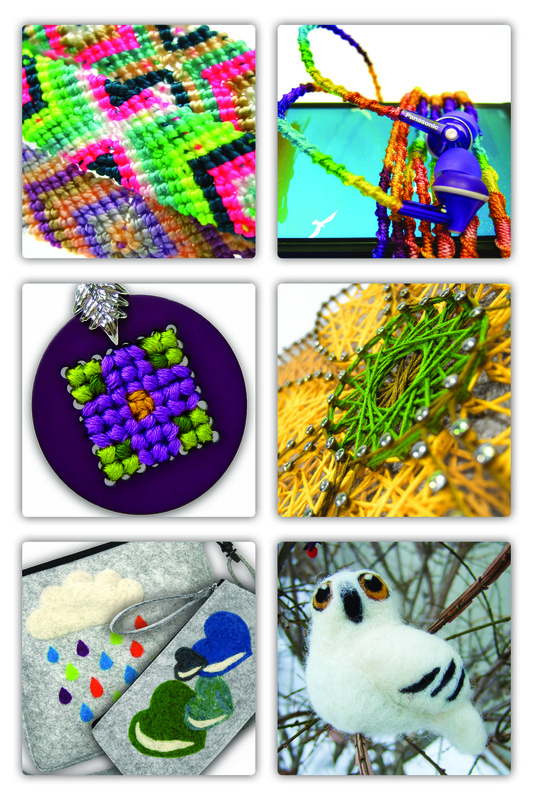 Crafting provides challenges to the brain and keeps the neural pathways stimulated. One clinical trial showed that the benefits of activities like crafting can last up to 10 years. Working on a crafting project also has mood elevating benefits, and can help those who are dealing with depression. Crafting stimulates the reward center in the human brain, causing it to release dopamine, a natural mood elevator. There is pleasure in the process of creating and then pleasure in seeing the finished project displayed or worn. Obviously, crafting is not a substitute for therapy or medication if the problem is on-going, but it can be a part of a concentrated program of treatment. For those who are simply having a blue mood or a bad day, crafting can help brighten things and provide focus and a sense of accomplishment. Crafting also has a wide variety of social benefits. People who quilt or knit or hand embroider often meeting in circles or guilds to share their work and offer tips and help to each other. There are Facebook groups for things like quilting, knitting and embroidery. Local quilt shops or yarn shops often offer classes where crafters can meet others who enjoy the same activities. Crafting also offer a way to be social to those who might be more introverted or uncomfortable in a social setting. Doing a craft offers a point of commonality and an easy way to interact with others. If you’re interested in gaining some of the benefits of crafting for yourself, we can help. Check out our Pinterest boards for craft tutorials and ideas for crafting projects. For those who want a project they can complete in a few hours, our Pretty Twisted Craft Kits are a great option. Finally, if you’re looking for supplies for machine embroidery, hand embroidery or crochet, you can find those on our site as well. Figuring out what stabilizer to use seems pretty simple. If you don’t want to cut, you use tearaway. If you don’t mind cutting, you use cutaway. Rolls are more economical, in most cases, but pre-cut sheets can be faster and easier. White can work on everything, but black or beige may sometimes be the better option, if those colors are available. Choosing a backing seems simple, but it may not be as simple as you think. The more you know, the better you understand how backing construction, type and even color can play a role in the success or failure of your finished embroidery. That’s where we come in. Part of what we do here at EnMart is teach. Our job, besides finding and selling top quality embroidery and sublimation supplies, is to teach you how to best use what we sell. It’s kind of a circle of life thing, we offer a backing for sale, we educate you about why that backing is a good buy and necessary to your project’s success, you buy it, your projects turn out fabulous, you come back and buy more backing. The cycle, hopefully, repeats, over and over again. 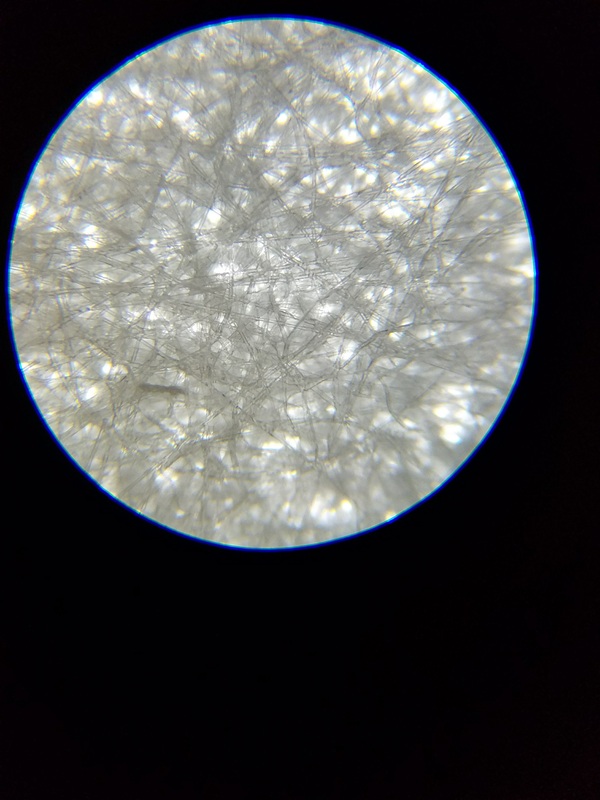 With that in mind, I wanted to take a moment today to share some photos of backing we took with a new tool we recently purchased, a microscope. 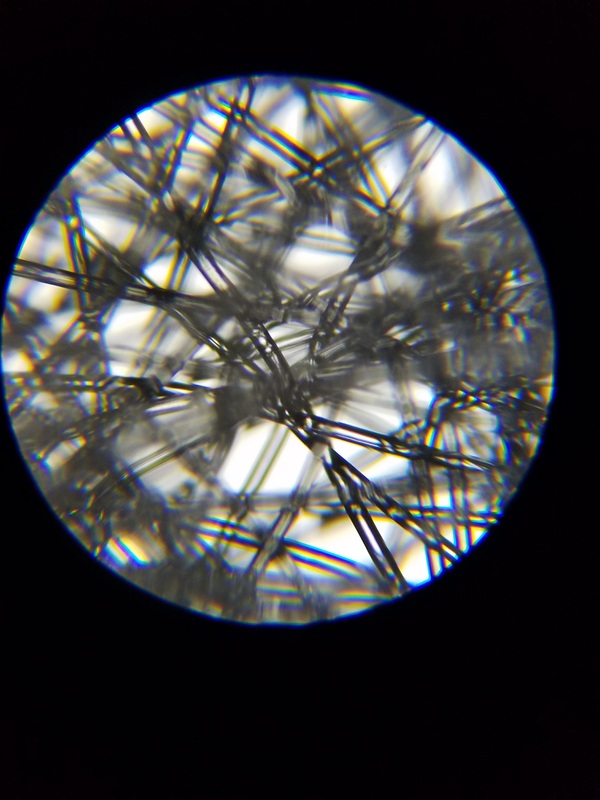 Now you may be wondering what a microscope can tell you about backing, and the answer is quite a lot. Here’s some of what we learned. This is our 2.5 ounce cutaway backing. The first thing you notice when you look at this picture is the long unbroken strands. That’s the sign of a cutaway, long strands of fiber which can’t be torn. The second thing you notice is how many strands there are. Quality backing will always have a good ratio of fibers to filler. Less fibers and more filler generally means a more uneven, less strong stabilizer. Next is our 1.8 ounce tearaway stabilizer. 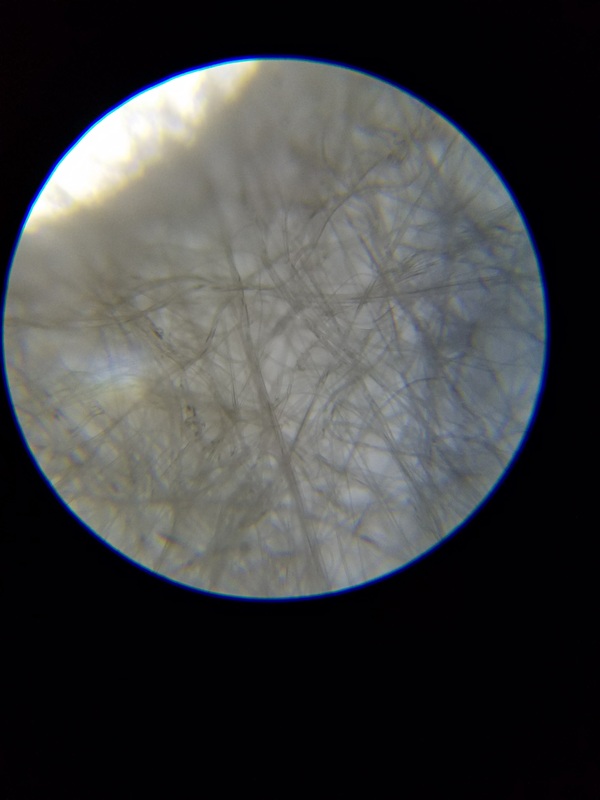 In this picture, you can see the fibers are shorter and thinner, which makes them easier to tear. Again, the ratio of filler to fiber is weighted on the side of the fibers, indicating that this is a quality backing. This is a backing which, if you did the light test, where you hold a piece up to a light source to see if it has uneven spots, would pass the test. Our third picture is of the poly mesh backing. It almost looks like a diamond, which is fitting, as poly mesh is a unique stabilizer. It is designed to hold a lot of stitches and has been textured to allow it to do so. Much like the name implies, you can see the fibers do form a kind of mesh and that, although the backing is thin, the fibers that make it up are thicker, allowing it to hold more stitches despite its thinness. Finally, we have our waffle-weave tearaway, which is designed to be extremely easy to tear. 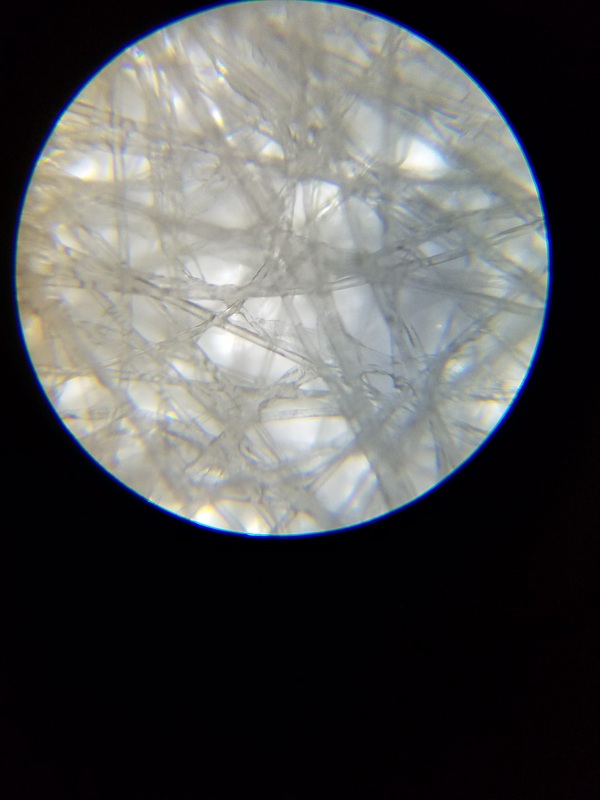 You can see that reflected in the fibers that are used to make up the backing. They’re extremely thin and very multi-directional. The fibers are also much shorter, which makes them easier to tear. This is a backing that could be torn apart quite easily. Understanding how backing is made, and how that method of creation impacts the finished product can help you make the best choices when choosing backing for your project. Now, we know that most of you will never put your backing under a microscope, but we never expected you would. That’s what we’re here for. We’ve got you back and your backing and we’re happy to help you make the best choices possible when it comes to purchasing supplies.